Coming back to school from summer vacation can be challenging for students who identity as lesbian, gay, bisexual, transgender, queer, questioning, and other identities (LGBTQ+). While it is often a return to supportive friends and teachers, it can also be a return to harassment, indifference, and exclusion. The Dane County Youth Assessment and the Wisconsin Youth Risk Behavior Survey show that LGBTQ+ youth have higher rates of anxiety, depression, suicide attempts, and other mental health disparities. LGBTQ+ youth also report feeling less connected to school, including not having trusted people they can talk to while there. In order to mitigate some of these factors, we hope our new Best Practices for Supporting LGBTQ+ Students as They Return to School resource, developed in collaboration with Mental Health America of Wisconsin, can help educators make the transition back to school comfortable and safe for your students. 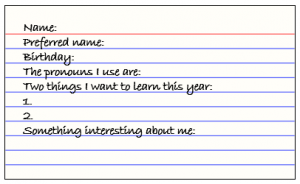 One the first day of class hand out an index card and ask students to answer a few questions about themselves, including what name and pronouns they prefer to use. Also asking them to share something interesting about themselves provides students a chance to share with you privately information they might not feel comfortable sharing in front of the entire class or in a one-on-one conversation with you. Let them know that this will help you to know a little bit more about them and be better able to create a safe and supportive classroom for everyone. Assure them the information shared is confidential, although you might follow up with them with specific questions or concerns. First Day of School Index Card by Stacy Mallette.